How Can Motor Legal Protection Help You? Motor legal protection provides legal assistance in recovering any uninsured losses in the event of a motor accident that wasn’t your fault. These uninsured losses can include such things as the cost of your policy excess, loss of earnings, damage to personal possessions or even personal injury to you or your passengers. Sometimes known as Legal Expenses Insurance our motor legal protection policy provides legal assistance to recover your uninsured losses and help you stay on the road after an accident that wasn’t your fault. Our motor legal cover provides up to £100,000 of legal representation, uninsured loss recovery and unlimited, like-for-like vehicle hire all as standard in our Bronze option. 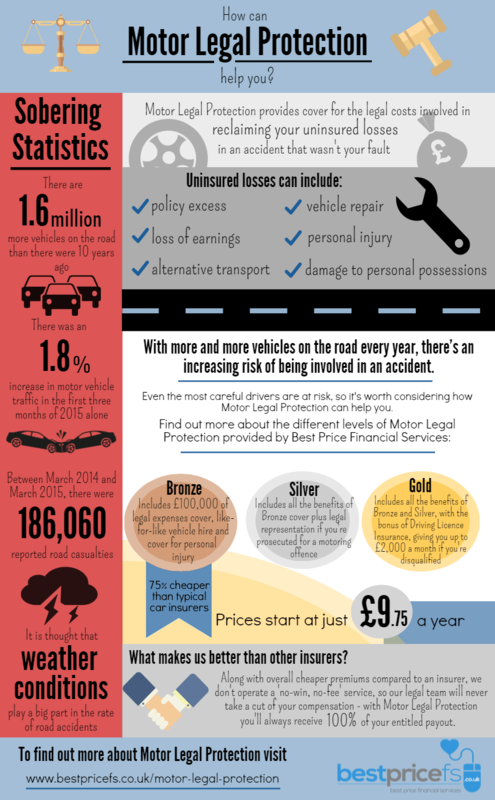 Check out this infographic and learn how the motor legal protection can help you.